As silly as it is, the “ignorance hypothesis”—the assumption that people in power would do right by their citizens if only they knew better—“still rules supreme among most economists and in Western policy-making circles,” Massachusetts Institute of Technology economist Daron Acemoglu and Harvard University political scientist James Robinson write in their new book, Why Nations Fail: The Origins of Power, Prosperity, and Poverty. 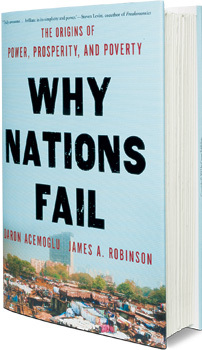 Nations fail, the authors argue, because “those who have power make choices that create poverty. They get it wrong not by mistake or ignorance but on purpose.” For the brutal few, hanging on to power and wealth outweighs all else.